Though it's still a month off in the United States, Canadians will celebrate Thanksgiving this weekend, with the big day taking place on October 14, 2013. 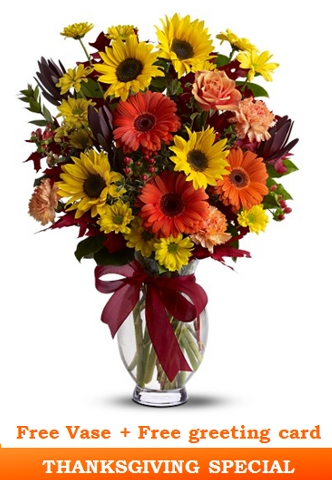 If you're scrambling for flower ideas, allow us to offer up the following: our Glorious Autumn Combo Special. This beautiful, rustic bouquet contains a stunning mix of Sunflowers, Gerbera Daisies, a Rose, Daisy Spray Chrysanthemums and Carnations in the colours of the season. Best of all, it includes a free vase and a greeting card. Bloomex delivers to nearly every part of the country so you can be sure your flowers will arrive fresh and on-time. Here's a photo of the bouquet, which along with the vase and greeting card, goes for just $39.99 for a limited time. Want to find out more? Here's a link to the Product Page where you can purchase it, if you'd like. Happy Thanksgiving, everyone!